WESTLAKE VILLAGE, Calif., Nov. 8, 2018 /PRNewswire/ -- Dole Packaged Foods, LLC has teamed up with musician Phillip Phillips and grocery retail company The Kroger Co. to provide a ray of sunshine this holiday season. On Thursday, November 15, shoppers at participating Kroger Family of Stores can help those in their community by purchasing DOLE Canned Pineapple. For every 20 oz. can of DOLE Pineapple purchased, Dole Packaged Foods, LLC will contribute one can to a local food bank. 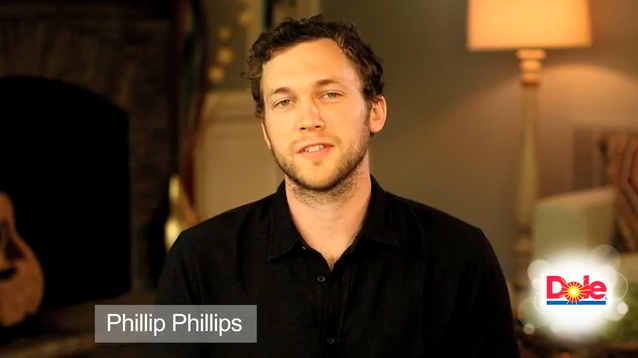 Dole Packaged Foods, LLC has teamed up with Phillip Phillips to Share the Sunshine this holiday season. For Phillip Phillips, the "Let Sunshine In, Drive Hunger Out" campaign represents a cause that's deeply personal. "I've traveled the country and seen friends and neighbors—many in my own hometown of Albany, Georgia—struggling with the uncertainty of not knowing where their next meal is coming from," said Phillips. "By purchasing a single can of DOLE Pineapple on Thursday, November 15, you're helping provide healthy meals to local families this winter." "At Dole, we are committed to supporting hunger relief efforts across the country," said Stan Stuka, Senior Director of Marketing, Dole Packaged Foods. "Through our buy one, give one campaign on Thursday, November 15, we are continuing to help community food banks across the nation. We hope this small act provides a ray of sunshine for families this winter." For more information on the "Let Sunshine In, Drive Hunger Out" campaign and to find participating retailers, visit DoleSunshine.com/HungerRelief. Dole Packaged Foods, LLC is a world leader in growing, sourcing, distributing and marketing fruit and healthy snacks. Dole sells a full-line of packaged ambient fruit, frozen fruit, dried fruit, and juices. The company focuses on four pillars of sustainability: water management, carbon footprint, soil conservation and waste reduction. For more information please visit DoleSunshine.com or Doleintlcsr.com. Since releasing his five-times-platinum debut single "Home" in spring 2012, Phillip Phillips has released two chart-topping albums and taken his expansive brand of earthy, guitar-fueled rock to stages across the globe. With his soulful vocals and ruggedly warm sensibilities, the Georgia-bred 26-year-old saw his first full-length effort, The World from the Side of the Moon, go platinum after debuting at #4 on the Billboard Top 200. In 2014 his second album, Behind the Light, offered up the lead anthemic folk-rock radio hit "Raging Fire." Phillips released "Miles" in the summer of 2017 as he toured North America with the Goo Goo Dolls, as a precursor to his recent and highly anticipated third full-length, Collateral. Collateral was released January 19, 2018 and also includes the recent single, "Into The Wild" and fan favorite, "Magnetic." Phillips toured in support of Collateral in winter 2018 with a headline North American run, and recently wrapped a summer co-headline run with Gavin DeGraw.